1National Marine Science Centre, Southern Cross University, Coffs Harbour, NSW 2450, Australia. A 30 day tank feeding trial was conducted to determine the optimal dietary ration for large (initial size and length, 1.7 kg, 54.27 cm) two-year-old mulloway (Argyrosomus japonicus) grown in seawater during winter (July-August, water temperature 17.01–20.58°C). Mulloway fed at 0.6% body weight (BW) day-1 were under-fed while feeding at 1.0% BW day-1 produced significant wastage, with up to 25% of the weekly ration un-eaten. Differences in growth were also evident; fish fed at 0.8 and 1.0% BW day-1 grew significantly faster (SGR, 0.33 and 0.34% day-1, respectively) than 0.6% BW day-1 (SGR, 0.23% day-1). Mulloway fed at 0.8% BW day-1 had the highest condition index (1.14), feed conversion efficiency (78.6%) with minimal wastage (0.31-2.1% of weekly ration un-eaten). The results of this study suggest that using a feeding rate of 0.8% BW day-1has the potential to maximize growth, reduce feed wastage and lower costs of mulloway production. Mulloway, Argyrosomus japonicus (Temminck & Schlegel, 1844) are a temperate, euryhaline, carnivorous finfish of the family Sciaenidae, commonly known as drums or croakers (Silberschneider and Gray 2008). Sciaenids are becoming increasingly important to global aquaculture and form the basis of significant aquaculture industries in the USA (Lee and Ostrowski 2001), China (Hong and Zhang 2003), Mediterranean waters around Greece, Italy, Croatia and Spain (Monfort 2010; Kruzic et al. 2016), and in the Eastern Cape of South Africa (Enviro-Fish Africa Pty. Ltd. 2009). Production of mulloway in Australia and NSW was based on sea-cage culture (Quartararo 1996; Rimmer and Ponia 2007) but more recently, an emerging industry is developing using aerated brackish-water prawn ponds in sub-tropical latitudes (25-30o) (Guy and Cowden 2012, 2014). Pond production techniques have been developed and a single-batch, a three-phase production system involving hatchery, fingerlings and grow-out phases is practiced with production rates of 12-14 tonnes ha-1 (Guy and Cowden 2012, 2015). Feed costs account for 42.5% of the total variable costs (Guy et al. 2014) and fish are fed a formulated, extruded, generic type marine fish's diet once or twice daily, and reach market size (2 kg live weight) in 22-24 months. To date, the fish has found a good market with top seafood restaurants (Guy and Nottingham 2014). One major constraint to further industry growth and profitability is a lack of knowledge about feed management and its efficient delivery. Previous studies have shown that, in the final year of grow-out (>1 kg live weight), food conversion efficiencies are poor (from 37-52%), well below the industry standard for marine fish and food wastage is a major issue (Guy and Cowden 2012). Excessive nutrient loading from overfeeding can cause harmful dinoflagellate blooms within culture systems, and coastal eutrophication when discharged, impacting on local flora and faunal communities (Glibert and Terlizzi1999; Russell et al. 2005). Current research, however, has focused only on hatchery and juvenile feeding strategies for this species (Fielder et al. 2010; Pirozzi et al. 2010) despite the fact that the greatest cost-saving with respect to feed can be made at the final grow-out stages of farming. This is also evident from the large number of studies, over the last decade, which apply only to small, juvenile or fingerling fish (De Silva et al. 1986; Eroldoğan et al. 2004; Fiogbé et al. 2003; Hassan and Jafri 1994; Hung et al. 1995; Khan and Abidi 2010; Mihelakakis et al. 2002; Oberg et al. 2014; Okorie et al. 2013). The consequence is that there are almost no baseline data for large fish, and optimal feeding strategies and physiological responses to over or under feeding for fish greater than 1 kg to market size remain largely unknown for many species, including mulloway. Research to identify a suitable restricted ration for two-year-old mulloway is therefore a high priority for the industry and our approach has been to investigate the current feed management on farms while attempting to optimise existing feeding practices. In early spring (water temperature 18-20oC), farmers feed anywhere from 0.6% to 1.0% body weight (BW) day-1. The more conservative, keen to economise in a high feed cost environment, keep daily consumption to 10 g fish-1 for fish over 1 kg in size or 70kg ha-1 while others are convinced that high feed rates (1% BW day-1) result in faster growth and a shorter production cycle (Andrew Carroll, farm manager, Palmers Island Mulloway Pty. Ltd., personal communication). Since there is currently no consensus and evidence to suggest which feeding strategy is optimal the objective of this initial study was to determine the optimum ration level in order to support better industry feed management practices. The feed used was an off-the-shelf 14 mm imported, formulated, extruded, fishmeal-based, sinking Japanese seabass (Lateolabrax japonicus) diet (Grobest Australia, Bray Investment Group Pty. Ltd.). Triplicate samples were analysed for proximate analysis by the Nutritional Biochemistry Laboratory, Coopers Plains, Brisbane, Queensland (Table 1). We used the farmer’s choice of feed in our study to ensure a relevant outcome that promotes adoption by industry. Two-year-old mulloway (n=190) were collected in autumn from a commercial fish farm 1.5 months before the scheduled experiments. Captured fish were transported by road in an oxygenated 900 L transport tank at a density of 75kg m-3 to experimental holding tanks maintained in an outdoor undercover area. The top of the tanks were fitted with a dark green cloth to provide cover and shade and supplied with a high rate (20L min-1) of continuously exchanging filtered seawater. Dissolved oxygen was maintained by delivering approximately 10 L min-1 of air, via diffusers, to the bottom of these tanks which were subjected to natural photoperiod and ambient climatic conditions. Fish were hand-fed the commercial diet (10 g fish-1) for two weeks at noon every other day (M, W, F) and, two days prior to experimentation, all feed was withheld. The fish were also treated twice (two days apart) with 200 mg L-1 formalin for one hour, two weeks prior to experimentation to eliminate ectoparasites (Noga 2010). Large mulloway (1.7 kg mean weight)with no deformities were stocked randomly into nine circular 3200 L tapered bottom polyethylene tanks at a stocking density of 11.3 kg m-3 (20 fish tank-1) in triplicate for each treatment (0.6%, 0.8%, 1.0% BW day-1). At the time of stocking there were no significant differences in the mean weight, length and condition of fish from the three feeding treatments (P>0.05) (Table 2). All tanks were supplied with their own intake line for water and air and a two level external stand pipe allowed different water levels to be maintained. A 200 mm x 50 mm round air diffuser was positioned inside the tank, 30 cm above the 50 mm outlet hole, by fastening it to the metal frame above. There were no internal stand-pipe and the flow rate was set at 16 L min-1 for the duration of the experiment. Fish were fed the 14 mm commercial diet and for each bag used 100 pellets (dry weight) were individually weighed to determine a mean pellet weight (g). Fish were hand-fed a restricted ration (0.6%, 0.8%, 1.0% BW day-1) at noon, six days per week using the feeding regime detailed in Guy and Cowden (2014). All uneaten pellets were collected by flushing the contents of the bottom external pipe into a coarse nylon net and then dried prior to counting (Helland et al. 1996). Tanks were visually inspected to check that no pellets remained and pipes flushed a number of times to ensure they were empty. The inflow water remained on unless sampling was to occur and in these instances the flow rate was reset to 16 L min-1 using a stopwatch and 5 L container. At day 16 all fish in each tank were anaesthetized with AQUIS (15 mg L-1), counted, bulk-weighed and returned to a cleaned tank. Mean weight and biomass were determined and the daily rations adjusted to account for growth. Water quality testing was conducted twice daily, six days per week (am and pm) using a U- 52 Horiba hand held multi-meter. Parameters recorded were pH (range 7.77-8.13) dissolved oxygen (6.27-8.76mg L-1), salinity (32.9-33.9ppt), conductivity (50.5-51.9mScm-1), turbidity (NTU) (0.1-1.0mg L-1), total dissolved solids (TDS) (30.3-31.1mg L-1) and this variation was common across all treatments. Water temperature (17.01-20.58°C) was recorded in triplicate at hourly intervals using calibrated submersible temperature loggers (iBCod 22L, Thermodata Pty. Ltd.). Water samples (100 mL) were collected twice weekly (am and pm) to determine the total ammonia nitrogen (TAN) (0.08-0.79 mg L-1) using a Palintest photometer 7100. Un-ionised ammonia nitrogen (NH3-N) (0.01-0.03mg L-1) was calculated from an online ammonia calculator using TAN, salinity, pH and temperature data.All water quality parameters were within the acceptable limits for marine finfish, however, these parameters are likely to vary more in a commercial pond grow-out environment (Guy and Cowden 2012). At the termination of the experiment (day 30), all fish in each tank were anaesthetized with AQUIS (15 mg L-1), individually counted, weighed and measured to determine survival rate, mean weight and length, condition index (CI =105W/L3 where W is weight and L is total length of the fish), absolute growth rate (AGR = (W2-W1)/t2-t1 increment of weight W2-W1 over a known time (t); g fish-1 day-1), specific growth rate (SGR= 100 x (loge final wt.-loge initial wt. )/days; % day-1), feed conversion ratio (FCR = dry feed intake (g)/wet weight gain (g)), feed conversion efficiency (FCE = wet weight gain(g) x 100/dry feed intake (g)) and protein efficiency ratio (PER = wet weight gain (g) /protein intake (g)). For statistical analysis the SPSS Version 22 software package (IBM) was used to conduct One Way ANOVAs with three repetitions (n = 3 tanks, mean of 20 fish tank-1)for growth performance and feed efficiency data. Means were compared using the Tukeys Honestly significant difference (HSD) method (P= ≤ 0.05). 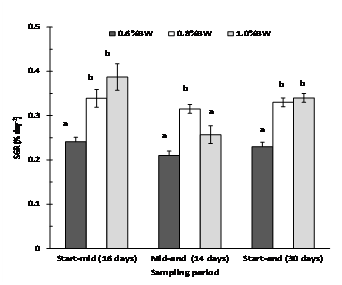 Daily feed intake was consistent in fish fed at 0.6% and 0.8% BW day-1 but became highly variable (erratic) in fish fed at 1.0% BW day-1after day 4, and this trend continued throughout the experiment (Fig. 1). Fish fed at 0.6% BW consumed all of their food with little to no wastage (<0.5% of all four weekly totals) (Fig. 2). However, mulloway fed at 1.0% BW day-1were overfed with a large amount of pellets recovered from each daily feed. On a weekly basis, the proportion of ration uneaten was variable and ranged from 8 to 25% (Fig. 2). The 0.8% BW day-1 was close to optimal with less than 1% wastage from weeks 1-3 and 2% in week 4; there was no significant difference between the 0.6% and 0.8% BW day-1feeding rate. Mulloway fed at 0.8% BW also had the lowest FCR and best feed efficiency and protein efficiency ratio (Table 2). Fish fed at 0.6% BW day-1 had significantly slower growth and weight gain than fish fed at 0.8 % and 1.0% BW day-1, but this was not reflected in their condition or feed efficiency (Table 2). Mulloway fed at 1.0% BW day-1showed the highest initial growth from 0-16 days (0.39% day-1), but this declined from 17-30 days (0.26% day-1) (Fig. 3). Mulloway fed 0.8% BW day-1 had the highest condition index (1.14) and less variation in growth rate over the sampling period (0.34 and 0.32 % day-1 after 0-16 and 17-30 days, respectively). Determining the optimum ration for best growth is one of the most difficult and important aspects of aquaculture (De Silva and Anderson 1995). The results of our preliminary study indicate that the optimum feeding rate for large mulloway (1.7 -1.9 kg) grown in seawater (33.5 ppt) at a mean water temperature of 18.8°C (range 17-20.6°C) lies close to 0.8% BWday-1. Here growth (SGR 0.33 % day-1) was as good as fish fed to satiation (1.0% BW day-1, SGR 0.34 % day-1), but more consistent, and feed wastage was low (0.31-2.1% of the weekly ration uneaten). This study also shows that two-year-old mulloway grow well at lower water temperatures (down to 18°C) than reported to be optimal for this species, although much of this work is only for small fish. Thermal studies on Juvenile mulloway by Bernatzeder and Britz (2007), Collett et al. (2008) and Pirozzi and Booth (2009) demonstrated a final preferred temperature range of 25–26.4 °C, 23.9-26.3°C and 28.5 °C for 20g, 24g and 182g fish, respectively, with food conversion efficiency maximized at a lower temperature (21.7 °C) than the optimal temperature for growth (Collett et al. 2008). We propose that larger mulloway have a lower temperature range for optimal metabolic function (Guy and Cowden 2014), however this remains to be tested. Handeland et al. (2008) study showed that the optimum temperature for fed conversion efficiency varied among size classes of Atlantic salmon (Salmo salar); larger fish (170-300g) had a much lower (11.0°C) optimal growth temperature than smaller (70-150g) fish (13.4°C).This has implications for the aquaculture of mulloway, particularly in terms of the seasonal temperature profiles at locations for culture, making colder water more attractive for large fish grow-out to market size and highlights the importance of doing research withmarket size fish. This has also been the experience with the meagre (Argyroso musregius), a Mediterranean species from the same family with best reported growth between 17-21 °C and reduced feeding activity at 13-15 °C (Monfort 2010). There is very little published information for comparison with our results: most previous studies have focused on small or juvenile mulloway ranging in size from 7-40 g (3- 5.1% BW day-1) (Collett 2007; Collett et al. 2008; Daniel 2004; Doroudi et al. 2004, 2006) and plate-sized fish (400-677 g, 1.1-1.75 % biomass day-1) grown in sea- cages and ponds (Allan et al. 2008; Mosig 2007; Quartararo 1996). As such, this study provides the first experimental data on feed optimisation in large mulloway and this has important implications for industry. This study clearly demonstrates that a strategy aimed at maximising growth through high feeding rates (1.0% BW day-1) will be inefficient, lead to significant wastage (8-25%) and highly variable daily intake. At the other end of the scale feeding well below this rate (such as 0.6% BW day-1) will negatively impact growth and extend the production cycle. Our past work has identified that around 4.8 tonnes of feed pond-1 (six days week-1), worth AU$9,600 (AU$2 kg-1), is consumed in the eight weeks of spring grow-out to market size with poor feed conversion and serious water quality issues (Guy and Cowden 2012). At this delivery rate dense phytoplankton blooms developed, leading to dissolved oxygen depletion and high ammonia levels when they senesced, causing stress and mortality of fish (Hargreaves and Tucker 2005). By contrast, farmers adopting an industry standard of 0.8% BW day-1at spring deliver only 3.84 tonnes of feed pond-1, a saving of 120 kg week-1 pond-1 in direct feed costs worth AU$1, 920 ponds-1. Indirect savings on aeration and water exchange (pumping) use are also likely, as water quality improves and blooms become manageable. While this is an important initial finding it remains to be tested under commercial culture conditions and the validation of this rate, through a series of on-farm feeding trials, would be an avenue for future work. This initial work in tanks, however, has been crucial in narrowing the range of values for further experimentation and refinement. This study also provides important baseline information that large mulloway respond, in a similar way to other carnivorous fish, to the reported relationships between feeding level, growth rate and feed efficiency (Kim et al. 2007; Klaoudatos and Apostolopoulos 1986; Li et al. 2004; Ozorio et al. 2009). Our results indicate that the optimum feed efficiency in market size mulloway (FCE 78.62% at 0.8% BW day-1) is achieved at feeding rates below satiation (FCE 76.40% at 1.0% BW day-1). This has been reported in other fish species such as the black porgy, (Sparus macrocephalus), minnows (Phoxinus phoxinus), southern catfish (Silurus meridionalis) and European sea bass (Dicentrarchus labrax) (Cui and Wootton 1988; Li et al. 1997; Russell et al. 1996; Xiao-Jun and Ruyung 1992). In each of these cases, the conversion efficiencies increased with increased ration size, from zero value at the maintenance ration to a peak at the optimum ration size, then decreased with further increases in ration size. One unexpected result, however, was the significant drop in specific growth rate of fish fed at 1.0% BW day-1from day 17 -30 (Fig. 3), despite eating more food than fish fed at 0.6 % and 0.8% BW day-1over this period.A possible explanation is that excessive eating (to satiation) causes progressive gastrointestinal issues in mulloway, overloading the stomach and intestine, and decreasing the efficiency of digestion and absorption, which limits the supply of energy destined to growth (Brett and Grove 1979; Hardy 1998). For example, in gilthead sea bream (Sparus aurata), increased feed uptake led to a rise in oxygen consumption (Guinea and Fernandez 1997) and such responses can decrease the efficiency of feed absorption by up to 15% (Elliott 1982; Jobling 1994); although we found no evidence of lower dissolved oxygen levels in the 1.0% BW day-1 fed tanks. Lower levels are, however, a common occurrence in static water ponds with dissolved oxygen levels of 3 mg L-reported in mulloway ponds (Guy and Cowden 2012). Large mulloway may therefore be particularly sensitive to overfeeding with one symptom or negative effect reduced growth and there appears to be a ration threshold above which the digestion physiology alters, however this remains to be tested. Du et al. 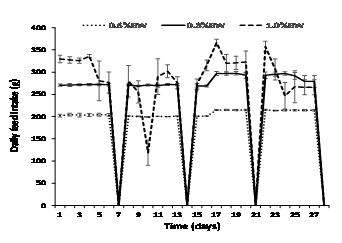 (2006) reported that when feeding rate exceeded 2% BW day-1 in juvenile grass carp (Ctenopharyngodon idella) the apparent digestibility coefficient decreased quickly and growth reduced. Negative effects have also been reported for African catfish (Clarias gariepinus) (Henken et al. 1985) and brown trout (Salmo trutta) (Elliott 1976) but the effect of feeding rate on apparent digestibility has been shown to be species specific with a positive and no effect demonstrated in southern catfish (Xie and Sun 1993) and walleye (Stizostedion vitreum) (Kelso 1972), respectively. Future work to monitor the apparent digestibility of the food, by collecting the faeces of large mulloway would provide more insight into the digestion and utilization of the feed at different levels of feeding. In conclusion, the successful adoption of these results has the potential to make mulloway production more efficient, environmentally friendly and sustainable. This work formed part of a project (PRJ-005806) funded by the Australian Governments Rural Industries Research and Development Corporation (RIRDC) New Animal Products R&D program. This work had ethics approval for research involving animals (SCU approval number ARA 12-13/01). Table 1 Proximate composition (dry matter basis) and pellet characteristics of the commercial diet1. 1 Data are means (± standard error) of triplicate samples. 4 Ash; by further heating in the Thermo gravimetric Analyser at 600°C in an atmosphere of oxygen. 5 Total Nitrogen; combustion method using an ElementarRapidN III analyser. 6 Crude protein; total nitrogen multiplied by a factor, usually 6.25. 7 Gross energy; determined using a LECO Automatic Calorimeter. 8 Crude fat; soxhlet extraction using hexane for 16 hours. 9 Crude fiber; AOAC method adapted for the Fibertec 2021 Fibrecap System. 10-11 Weight and diameter; from three separate bags (100 pellets each). Fig. 1 Daily feed intake of mulloway (Argyrosomus japonicus) fed at 0.6 %, 0.8 % and 1% body weight (BW)day-1 in tankssix days per weekover 30 days. Daily data are means ± S.E. of three replicate tanks. Table 2 Influence of feeding rate: 0.6%, 0.8% and 1.0% body weight (BW) day-1, six days per weekat noon on growth parameters, feed efficiency and condition of mulloway (Argyrosomus japonicus) reared in tanks for 30 days1. 1Data are means (± standard error) of three replicate tanks (20 fish each) for each feeding rate (n=180). Rows with different letters (a, b) are significantly different (P < 0.01; Tukey test). P is probability value and ** highly significant. 2Fulton’s condition index (CI) =105W/L3 where W is the weight and L is the total length of the fish. 3 Survival (%) = n2/n1 x 100 where n2 is the remaining number of fish and n1 is the original number of fish. 6 Specific growth rate (% day-1) = 100 x (loge final wt.-logeinitial wt.)/days. 7 Feed conversion ratio = dry feed intake (g)/wet weight gain (g). 9 Protein efficiency ratio = wet weight gain/protein intake. Fig. 2 Percentage of weekly ration uneaten by mulloway (Argyrosomus japonicus) fed at 0.6 %, 0.8 % and 1% body weight (BW)day-1 in tanks over 30 days. Data are means ± S.E. of three replicate tanks. Columns with different letters (a, b) within each week are significantly different (P < 0.01; Tukey test). Fig. 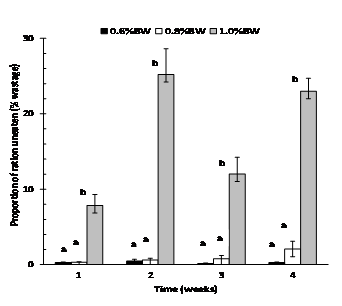 3 Specific growth rate (SGR % day-1) of mulloway (Argyrosomus japonicus) fed at 0.6%, 0.8% and 1% body weight (BW) day-1 in tanks over three sampling periods; 0 –16 days, 17-30 days and overall (0-30 days). Data are means ± S.E. of three replicate tanks. Columns with different letters (a, b) within each sampling period are significantly different (P < 0.05; Tukey test). Allan GL, Heasman H, Bennison S (2008) Development of industrial-scale inland saline aquaculture: Coordination and communication of R and D in Australia. FRDC Project No. 2004/241, p235. Bernatzeder A, Britz PJ (2007) Temperature preference of juvenile dusky kob Argyrosomus japonicus (Pisces: Sciaenidae). Afr J Mar Sci 29:539?543. Collett PD (2007) Toward the development of a rearing protocol for juvenile dusky kob, Argyrosomus japonicus (Pisces: Sciaenidae). MSc thesis, Rhodes University, South Africa, p 60. Collett PD, Vine NG, Kaiser H, Baxter J (2008) Determination of the optimal water temperature for the culture of juvenile dusky kob Argyrosomus japonicus Temminck and Schlegel 1843. AquacRes 39:979-985. Cui Y, Wootton RJ (1988) Bioenergetics of growth of a cyprinid, Phoxinus phoxinus (L.): the effect of ration and temperature on growth rate and efficiency. J Fish Biol33:763-773. Daniel SJ (2004) Investigation into the nutritional requirements of juvenile dusky kob, Argyrosomus japonicus (Pisces: Sciaenidae), under ambient culture conditions. MSc thesis, Rhodes University, South Africa, p117. De Silva SS, Anderson TA (1995) Fish Nutrition in Aquaculture. Chapman and Hall, London, p 319. De Silva SS, Gunasekera MR, Keembiyahetty C (1986) Optimum ration and feeding frequency in Oreochromis niloticus young. In: Maclean JL, Dizon LB, Hosillos LV (eds) The First Asian Fisheries Forum. Asian Fisheries Society, Manila, pp 559?564. DoroudiMS, Allan GL, Fiedler DS (2004) Two year R and D program on inland saline aquaculture 2001-2003.Final report for NSW Fisheries, Murray Irrigation Limited and Department of State and Regional Development, p 27. Doroudi MS, Fielder DS, Allan GL, Webster GK (2006) Combined effects of salinity and potassium concentration on juvenile mulloway (Argyrosomus japonicus, Temminck and Schlegel) in inland saline groundwater. AquacRes 37:1034-1039. Du Z-Y, LiuY-J, Tian L-X, He J-G, Cao J-M, Liang G-Y (2006) The influence of feeding rate on growth, feed efficiency and body composition of juvenile grass carp (Ctenopharyngodon idella). Aquacult Int 14(3):247-257. Elliott JM (1976) Energy losses in the waste products of brown trout (Salmo trutta L.). J. Anim.Ecol. 45:561?580. Enviro-Fish Africa Pty Ltd (2009) Pilot Commercial Production Facility for the Farming of the Dusky Kob in Kwa-zulu Natal. Report for Department of Agriculture and Environmental Affairs KwaZulu-Natal, p 78. Eroldo?an OT, Kumlu M, Akta? M (2004) Optimum feeding rates for European sea bass Dicentrarchus labrax L. reared in seawater and freshwater. Aquaculture231:501-515. Fielder DS, Ballagh D, Booth MA, Pankhurst PM, Becker CE, Allan GL (2010) Aquafin CRC Project 1B5: Feed Technology for Temperate Fish Species, Vol 1, Feeding Strategies. FRDC Project No. 2004/220, p 376. Glibert PM, Terlizzi DE (1999) Cooccurrence of elevated urea levels and dinoflagellate blooms in temperate estuarine aquaculture ponds. App Enviro Micro 65:5594?5596. Guy JA, Cowden KL (2012) Re-invigorating NSW prawn farms through the culture of mulloway. Report PRJ-002273 to the Rural Industries Research and Development Corporation (RIRDC), Publication No 11/178, p136. Guy JA, Cowden KL (2014) Optimising mulloway farming through better feed and hatchery practices. Report PRJ-005806 to RIRDC, Publication No 14/109, p 97. Guy JA, Cowden KL (2015) Prawn hatchery modifications and adaptions for temperate marine fish culture in northern NSW, Australia. Guy JA, Nottingham S (2014) Fillet yield, biochemical composition and consumer acceptance of farmed and wild mulloway. J Aquat Food Prod Tech 23:608-620. Guy JA, McIlgorm A, Waterman P (2014) Aquaculture in Regional Australia: Responding to Trade Externalities. A Northern NSW Case Study. J Econ Soc Pol 16:1-29. Handeland SO, Imsland AK, Stefansson SO (2008) The effect of temperature and fish size on growth, feed intake, food conversion efficiency and stomach evacuation rate of Atlantic salmon post-smolts. Aquaculture 283:36-42. Hardy RW (1998) Feed salmon and trout. In: Lovell T (ed) Nutrition and Feeding of Fish, 2nd edn. Kluwer, Boston, pp175-197. Hargreaves JA, Tucker CS (2005) Conditions associated with sub-lethal ammonia toxicity in warmwater aquaculture ponds. World AquaMag 36:20-24. Hassan MA, Jafri AK (1994) Optimum feeding rate, and energy and protein maintenance requirements of young Clarias batrachus (L.), a cultivable catfish species. AquaFishMan 25: 427-438. Hung SSO, Conte FS, Lutes PB (1995) Optimum feeding rate of white sturgeon, Acipenser transmontanus, yearlings under commercial production conditions. JAppAqua 5:45-52. Jobling M (1994) Fish Bioenergetics. Chapman and Hall, London, p 300. Kelso JRM (1972) Conversion, maintenance, and assimilation for walleye Stizostedion vitreum, as affected by size, diet, and temperature. J Fish Res Board Can 29:1181?1192. Khan M, Abidi S (2010) Optimum ration level for better growth, conversion efficiencies and body composition of fingerling Heteropneustes fossilis (Bloch). Aquacult Int 18:175-188. Kim K-D, Kang YJ, Kim K-W, Kim K-M (2007) Effects of Feeding Rate on Growth and Body Composition of Juvenile Flounder, Paralichthys olivaceus. J World Aquacult Soc 38:169-173. Li J, Xu S-h, Xu C-a (1997) Effect of ration, temperature and body weight on growth of black porgy, Sparus macrocephalus (B.). Chin J Oceanol Limnol 15:289-295. Li MH, Manning BB, RobinsonEH (2004) Effect of Daily Feed Intake on Feed Efficiency of Juvenile Channel Catfish. N Am J Aquacult 66:100-104. Monfort MC (2010) Present market situation and prospects of meagre (Argyrosomus regius), as an emerging species in Mediterranean aquaculture. Studies and Reviews. General Fisheries Commission for the Mediterranean, no. 89, Rome, FAO, p 28. Mosig J (2007) Wakool saline basin produces a good feed of fish. Austasia Aquacult 21:51-55. Noga EJ (2010) Fish Disease: Diagnosis and Treatment, 2nd edn. Wiley-Blackwell, Iowa, p 536. Oberg EW, Faulk CK, Fuiman LA (2014) Optimal dietary ration for juvenile pigfish, Orthopristis chrysoptera, grow-out. Aquaculture 433:335-339. Okorie OE, Bae JY, Kim KW, Son MH, Kim JW, Bai SC (2013) Optimum feeding rates in juvenile olive flounder, Paralichthys olivaceus, at the optimum rearing temperature. Aquac Nutr 19:267-277. Ozorio ROA, Andrade C, Timoteo VMFA, Conceicao LEC, Valente LMP (2009) Effects of feeding levels on growth response, body composition, and energy expenditure in Blackspot Seabream, Pagellus bogaraveo, Juveniles. J World Aquacult Soc 40:95-103. Pirozzi I, Booth MA, Allan GL (2010) The interactive effects of dietary protein and energy on feed intake, growth and protein utilization of juvenile mulloway (Argyrosomus japonicus). Aquac Nutr 16:61-71. Rimmer MA, Ponia B (2007) A review of cage aquaculture: Oceania. In: Halwart M, SotoD, Arthur JR (eds) Cage aquaculture - Regional reviews and global overview. FAO Fisheries technical paper no. 498,pp 208?231. Russell B, Elsdon T, Gillanders B, Connell S (2005) Nutrients increase epiphyte loads: broad-scale observations and an experimental assessment. MarBiol. 147:551-558. Russell NR, Fish JD, Wootton RJ (1996) Feeding and growth of juvenile sea bass: the effect of ration and temperature on growth rate and efficiency. JFish Biol 49:206-220. Silberschneider V, Gray C.A (2008) Synopsis of biological, fisheries and aquaculture-related information on mulloway Argyrosomus japonicus (Pisces : Sciaenidae), with particular reference to Australia. J Appl Ichthyol 24:7-17. Xiao-Jun X, Ruyung S (1992) The bioenergetics of the southern catfish (Silurus meridionalis Chen): growth rate as a function of ration level, body weight, and temperature. J Fish Biol 40:719-730. Xie X, Sun R (1993) The faecal production and digestibility of the southern catfish (Silurus meridionalis Chen) in relation to ration level, body weight and temperature. Oceanol Limnol Sin 24:627?633.